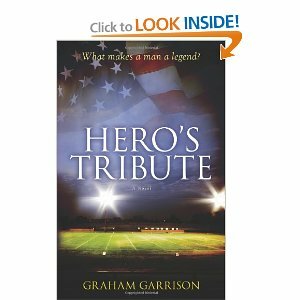 The book cover asks, “What makes a man a legend?” In this novel,the author proceeds to break down the legend of the late Michael Gavin and show his humanity. Told through the eyes of multiple characters, including the reporter who receives the strange assignment of giving Gavin’s eulogy, the story makes a sluggish start. Immediately in the opening, the reader learns of the death of the title’s hero, and may feel anticlimactic and bogged down in the details of various individual and group reactions to Gavin’s passing. However, the plot picks up momentum as Michael Gavin’s life unfolds through the research of Wes Watkins, one of the small town’s sports reporters. Following the list he’s given, Wes takes off in search of both his news story and the assigned eulogy, determined to find out why he’s the chosen speaker for Gavin’s funeral. He uncovers secrets from Gavin’s past and begins to learn some truths about his own life. With a few surprising twists, Hero’s Tribute satisfied my hunger for a good story. Only the most skillful authors pull off the multiple-viewpoint plot well. William Faulkner and Jodi Picoult come to mind. Garrison does it better in some places than others, especially when he’s giving the back story of the various people whose lives were most deeply affected by Gavin. The mystery he injected into Michael and Watkins as his chosen eulogist kept my interest, and by the close of the book, I was not disappointed. The genre could be considered inspirational fiction, but the book does not so much focus on Christian themes as incorporate principles generally upheld in our culture. The actions, words, and thoughts of the characters portray values, rather than preaching them. An impatient reader may not endure, but for the one who does, Hero’s Tribute is worth the persistent read. *The reviewer received a free review copy.